Bunny cake creations are terribly expensive to buy, so why not make your own using your favorite cake mix and our instructions on how to cut up the cake to make a bunny shape? Your bunny cake is certain to cause some ‘ooohs and ahhhs’ from company and kids alike, so be sure to display it before dinner on the sideboard or table. 1. Bake two round cakes from your favorite cake recipe or cake mix. 2. One round cake will become the bunny’s face, while the other is cut according to the diagram at right, creating two bunny ears and a bow tie. 3. Position the ears at the top of the round cake, and the bow tie at the bottom, as shown in the colored diagram at left. 4. Use frosting, or thawed Cool Whip topping to attach the cake pieces together, then continue frosting the cake as usual. 5. Sprinkle the entire cake with shredded coconut. You may wish to use pink tinted coconut on the inside of the ears and for all or part of the bow tie. 6. Finish creating the bunny’s facial features using small chocolate easter eggs, gumdrops, jelly beans or smarties for the eyes and nose and red licorice strings to form the whiskers and a smiling mouth. 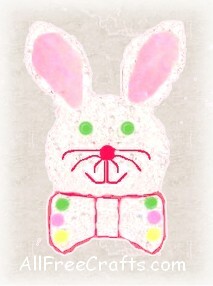 Don’t forget to add some cheerful candy polka dots to the bow tie!